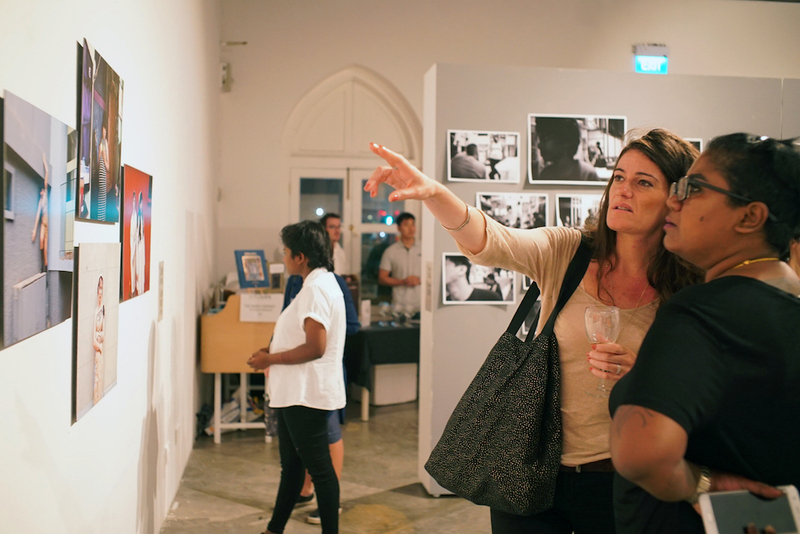 The Women in Photography exhibition, this year themed on domesticity, familial ties and feminine identity, opened at Objectifs on Thursday, 12 Oct 2017 . 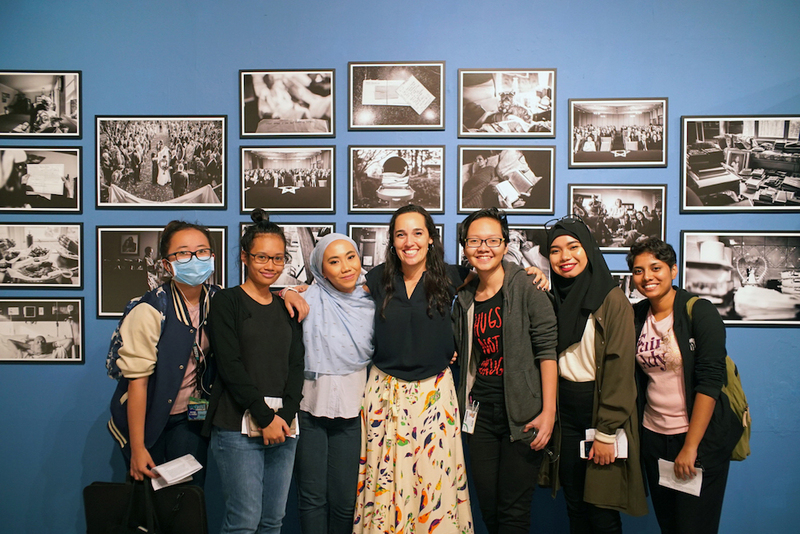 Five of the eight featured photographers were in attendance: Nancy Borowick, Maika Elan, Sandra Mehl, Emilie Régnier and Bernice Wong. 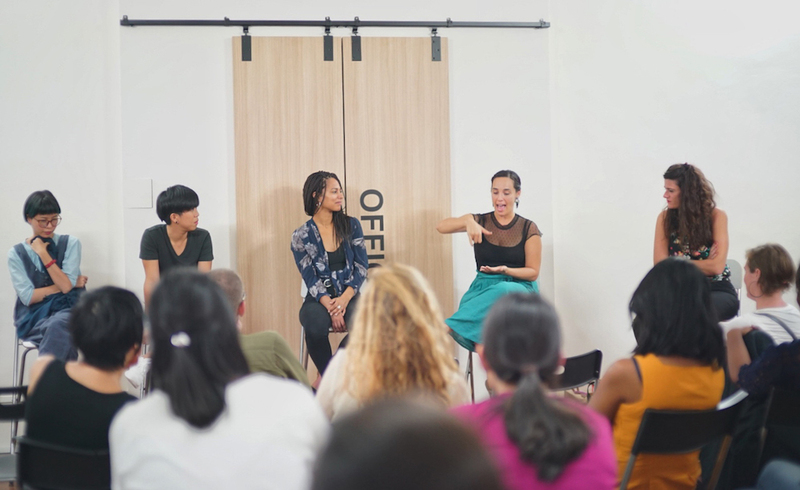 They participated in a panel discussion moderated by exhibition curator Emmeline Yong, and gave artist talks about their respective practices. Read on for a recap from these opening programmes. 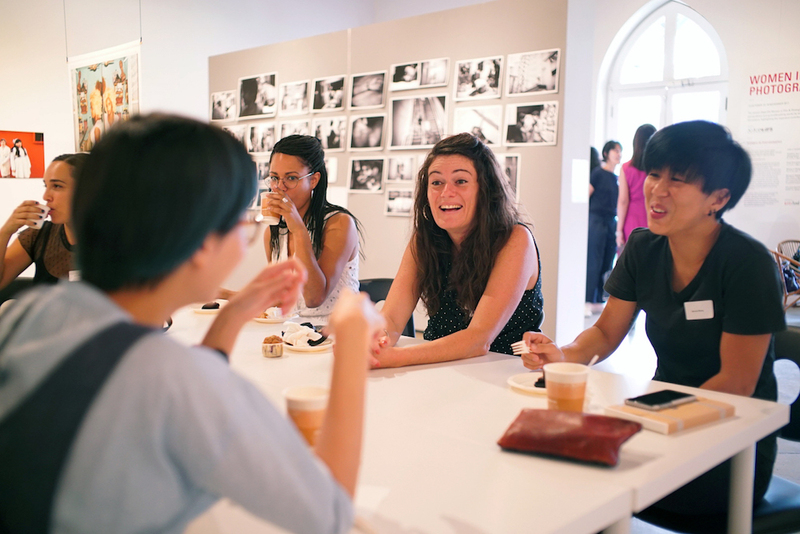 L-R: Exhibiting photographers Maika Elan, Bernice Wong, Emilie Régnier, Nancy Borowick and Bernice Wong at a panel discussion during the opening weekend of Women in Photography 2017 at Objectifs. Emmeline, the exhibition’s curator, shared that it is a photographer’s personal work that makes them stand out and builds their reputation. The photographers spoke about what motivated them to start on their personal projects, what keeps them going and how they fund this work. Sandra’s series about sisters Ilona and Maddelena is as much about who she is and where she comes from as it is about them. She lives in the south of France while the country’s art scene is concentrated in Paris. So she “created [her] network through [her] work”, making work that was close to her heart and working-class roots. Her first two personal projects were geographically close to home, so she could keep production costs low. She’d then go to Paris for portfolio reviews and started to get media assignments on the strength of her projects. Now, she is able to live off her photography. She now seeks, through her personal projects, to look at her roots with a “beautiful eye”. She wants to show that “the working class are also holders of great culture” and feels this project says something about her, but also about “people in general”. Photographer Sandra Mehl shares her series about “Ilona and Maddelena”. Nancy worked at a small local newspaper after she graduated from the International Center of Photography, “refusing to say no” to any opportunities to prove herself and build her photojournalism career. She was “terrified of personal projects” but when both her parents were ill with cancer, seeing through a camera became her “way of processing, controlling, in an uncomfortable environment”. She submitted A Life in Death to a contest as she “wanted to know if anyone else cared” about the story. An editor from The New York Times noticed it and from there, it took off “organically”. Nancy emphasised that with access comes responsibility. As she was new to personal projects and was so close to this story involving her family, she sought out “other perspectives” from mentors and contacted other photographers doing similar work. Emilie started her photography shooting conflict, as it was her longtime dream, until an episode in dangerous circumstances in the north of Mali led her to admit to herself she was “not cut out for it”. In Bamako, Mali, she picked up a film camera and actively started to seek out “things I find beautiful”; she no longer wanted to “document misery, death”. She had to be open to redefining her identity as a photographer. From searching for the literally beautiful, her projects have grown to explore Black, African women’s ideas of beauty and how it relates to African-American perspectives on the same topic as in her series Hair. Emilie Régnier introduces her series “Hair” during a guided tour of the exhibition. Bernice had “difficulties finding stories in Singapore” when she started out, and was working in countries like Bangladesh and Cambodia. She learnt about Mel and her family, the subjects featured in School of Hard Knocks, when she met one of Mel’s daughters in a children’s home. Mel was very open and immediately granted Bernice access; three years on, they are like family and she sees this as a lifelong project. 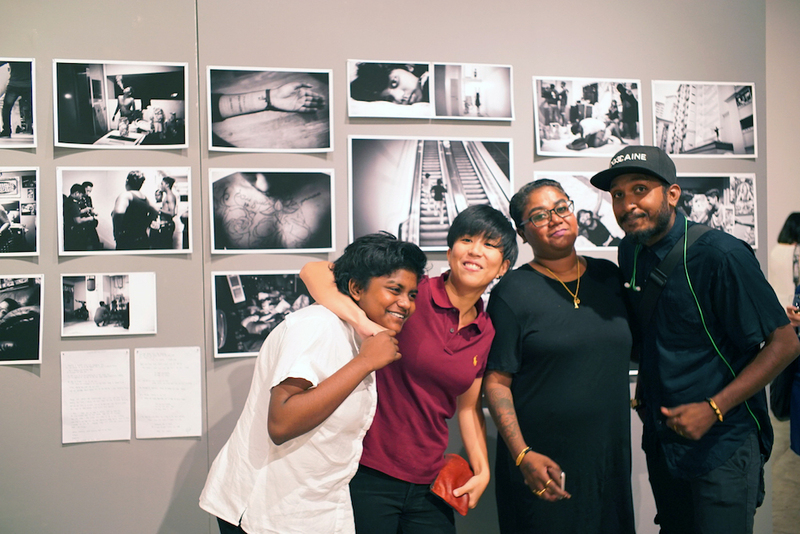 Bernice Wong with Mel, the main subject of her photo series “School of Hard Knocks”, and Mel’s family. As a mother of a young boy, Maika brought up the challenges of working in an industry which requires a fair amount of traveling and time. She had to forgo some overseas assignments and career opportunities, having chosen to prioritise her family. Instead, she turned her focus to projects closer to home, such as her series Like My Father. Maika is curious about “what goes into people’s living”. “If you don’t do [it], no one else can do [it]” is her litmus test for projects she feels most urgently compelled to pursue. The idea for The Pink Choice started when she participated at the Angkor Photo Workshop. Her very decision to continue this series, in Vietnam was spurred by her research, which made it apparent there was no “information” in local pictures of LGBT people. Showing examples, she said: “They’re often disembodied, wearing masks, or only shown as a pair of holding hands”. Local films were either dramatic, only showing pain as inevitable if one came out, or comedic in a disrespectful way towards LGBT people. Photographers working on documentary projects with subjects, communities or themes they are deeply invested in face the dilemma of when to shoot, and when to put down the camera and engage differently. The photographers agreed that there are times they don’t shoot or even bring their cameras along intentionally. Bernice trusts that “there will be other moments I can capture later”, given her long-term commitment to her subjects, and even Nancy, who had an awareness of her project’s finitude given her parents’ terminal cancer, agreed that engaging with one’s subjects can “inform future photos”. Even in her project, there were opportunities she got to reshoot certain images, due to the repeating nature of certain routines like chemotherapy. Nancy Borowick poses in front of her series “A Life in Death” with art students during the opening. Sandra agreed but also sometimes “felt more with the person when holding the camera, more intense, deeper”. In her practice she has come to prefer “the before or after moment” rather than the “decisive moment” which is “done a lot”. For Emilie, it was “the camera that made [her] interested”. While she initially resisted the “fashion photographer” label after she moved away from covering war, she had a strong interest in “the way we dress, what we’re going to say about ourselves to the world”. From Emilie’s portraits, we can see how her subjects’ fashion choices can demonstrate their agency. 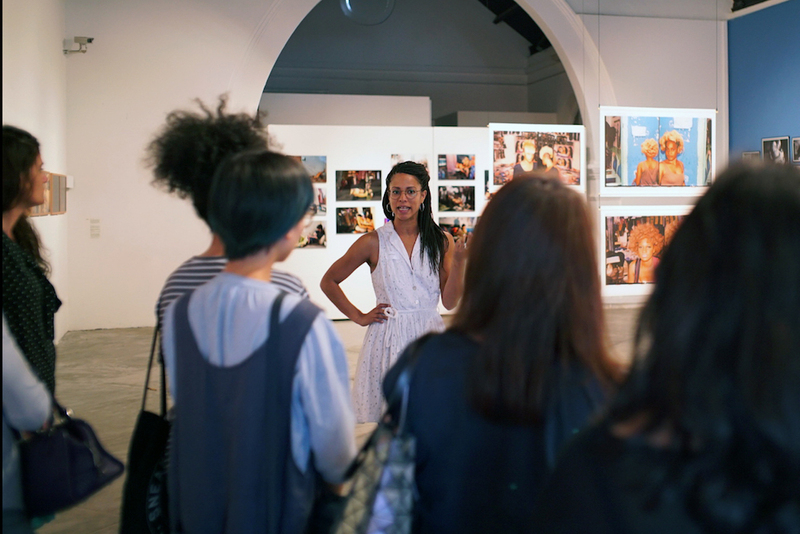 Maika sharing her series “The Pink Choice” during a guided artist tour. Finally, Maika made time when shooting couples for The Pink Choice to “take photos as they want”. Nonetheless, as her project developed, meeting with more than 100 couples and photographing 72 of them, she gained clarity on what she wanted her photographs for the series to look like. She expressed surprise in the extent to which they trusted her, some even joining the project as a way of coming out. In order to document her subjects in their intimate spaces, she would position herself in a corner which had good lighting and “interesting things”, but otherwise did not intervene in the setting or the couple’s routine as far as possible. In editing her photographs for this series, she relies on instinct to keep in the ones she “cannot take out”, and ensures all the images will reflect the “real moments” to the audience. It’s a wrap! 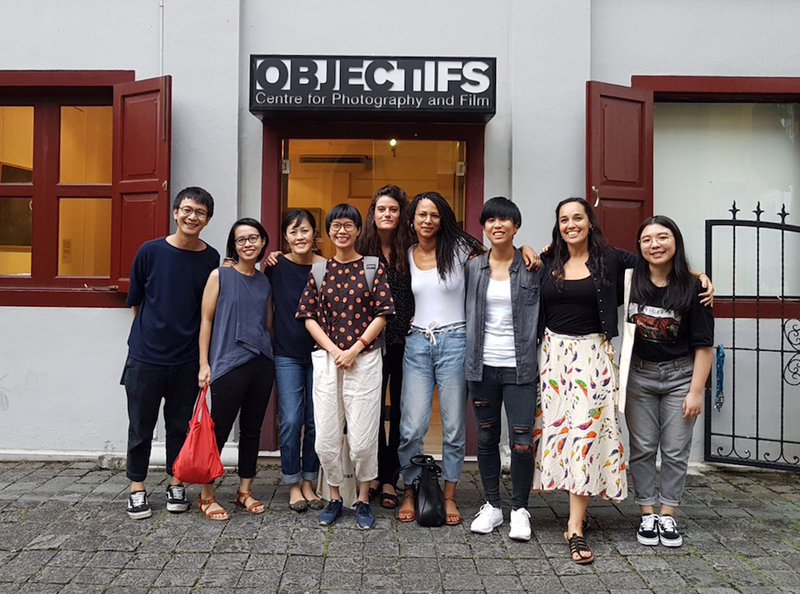 Objectifs staff with the exhibiting photographers after a busy weekend — the exhibition opening, a networking lunch, guided exhibition tour, panel discussion and artist talks. View the Women in Photography exhibition at Objectifs till 19 November. Admission is free. 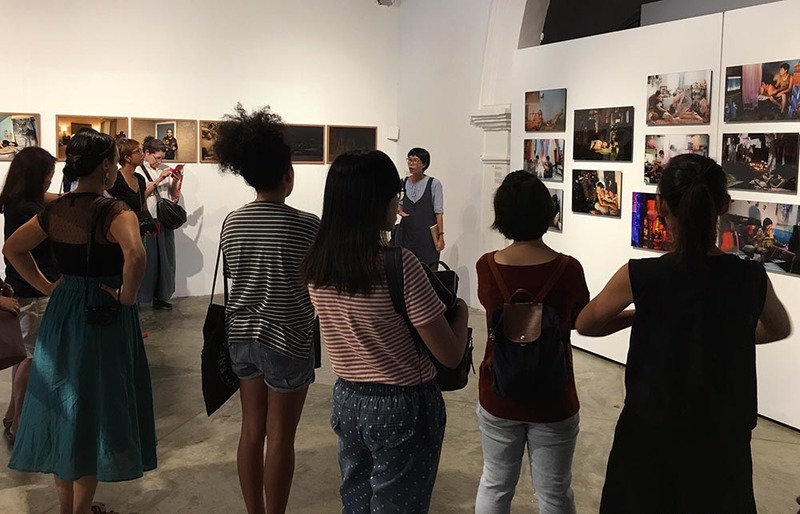 Join us for an evening slideshow projection featuring the Asian Women Photographers’ Showcase on 15 Nov, 7.30pm to 8.30pm. Register here; entry is by donation at the door.